This was a very light and fun read for the holidays. Some of the stories were amazing while others were just ok. Overall a good book. Initial Impressions 12/14/14: Just loved this collection of stories! It was so wonderful too to have a combination of contemporary and fantasy. My favorite was definitely Rainbow's (she just melted me) but also love Laini Taylor, Holly Black, Gayle Forman, and Stephanie Perkins (and really just all of them). What a really wonderful idea! Full review to come. 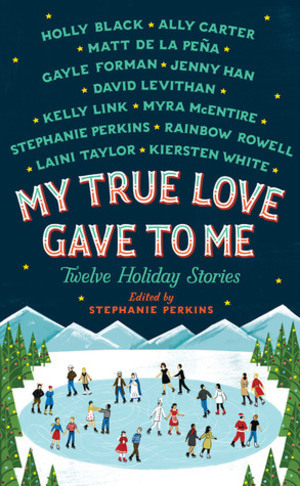 Full review originally posted HERE on The Book Addict's Guide 12/24/14: I love that these authors got together to put MY TRUE LOVE GAVE TO ME out into the world. There are definitely some of my favorite authors’ works in here (Rainbow! Gayle! Stephanie!) and I had soooo much fun reading all of these short stories (although some I wished would go on forever)! It’s hard to review a collection of short stories so I’ll just say a few things on each one of them!